Chapel gathers the campus community every other Wednesday at 10 a.m. in the Church-Chapel for 40 minutes, where we come together before God in worship and seek to be continually formed into the image of Christ. For attendance requirements visit the convocation and chapel website. Need to find a local church home? Learn about churches in Goshen and the surrounding area in the online directory of churches and ministers. Taizé prayer service, typically held the first Sunday evening of each month, is a candlelight service that includes song, prayers, Scriptures and silence. Watch the Campus Communicator for announcements of when this semester’s services will be held. A student club who meets weekly for a time of hymn singing. Watch the Campus Communicator for announcements, or contact Bob Yoder, campus pastor (robertey@goshen.edu), for details. 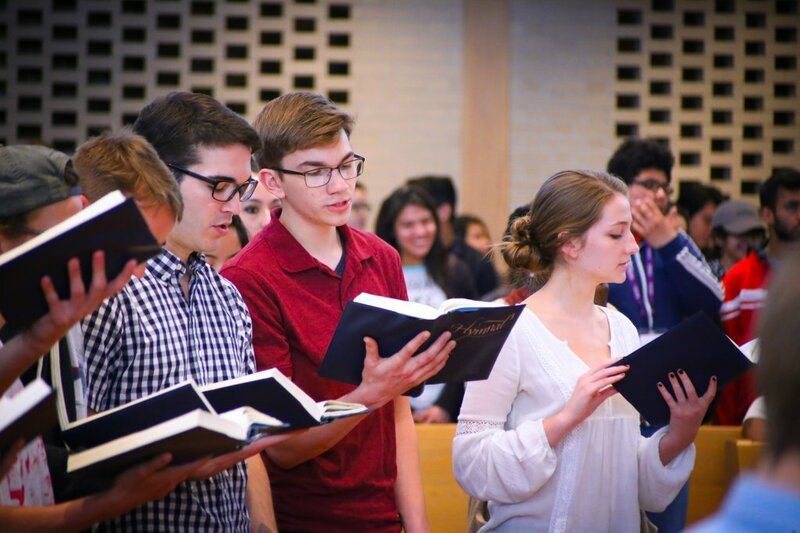 As student interest dictates, we are happy to arrange for a variety of types of worship services that nourish your soul. Contact Campus Ministries to make arrangements.